On Friday our family got together for Thanksgiving dinner. 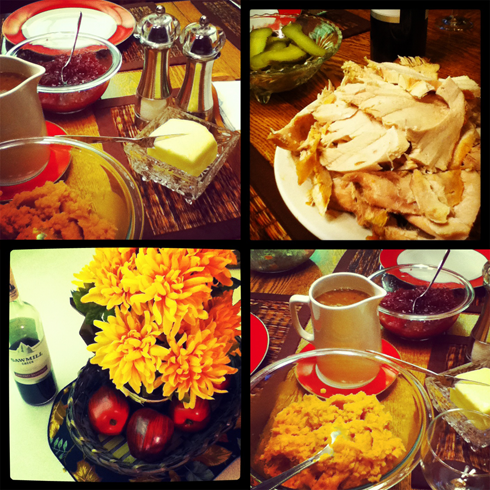 My parents spent the day preparing a delicious turkey with mashed potatoes, yams, stuffing, garden salad and pumpkin pie. 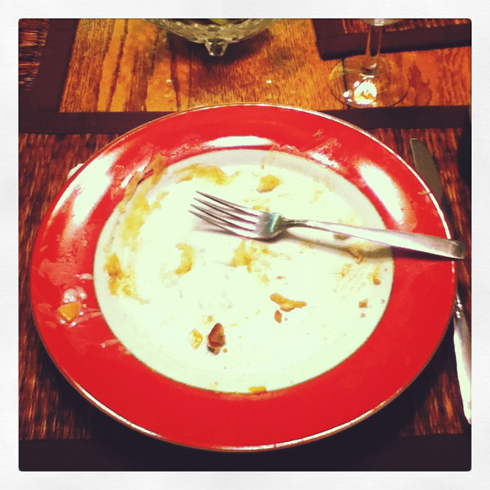 It was incredibly good. I would have turkey dinner once a week if I had someone else to prepare it for me - naturally. It's been a difficult few months. With so much going on it was a nice change of pace to sit down with everyone for a home-cooked meal. I feel like I've been having a rough go of things, separated from friends, lots of unexpected expenses, and a general apathy towards some of my routines. Thanksgiving is about being thankful though, and I've realized that as bad as things may seem sometimes I've obviously got a lot to be grateful for. I'm thankful for the people in my life, for my friends, family, and the random readers who will see this. The fact that I've convinced myself to keep this journal for so long must be a reason to give thanks too. I'm thankful for my health, for my body, for my mind. I'm thankful for my home, for my bed, and for the one or two nights a week when I manage to get a decent sleep. I love my car, and I'm thankful for the days when it's working properly. I'm thankful that I'm able to inspire myself. I'm even more thankful when others do it. I'm happy that I've managed to find jobs that challenge me creatively, and I'm thankful that I proved my fears as a film student wrong by getting them. I'm thankful that Arrested Development is coming back and that I still have time to watch TV, because I'm also thankful for my sense of humor. I'm thankful for good food. I'm thankful for those who share it with me. I'm thankful that there's a lot of love around me, even on those days when I don't recognize it. And maybe most of all, I'm genuinely thankful that despite knowing my worst mistakes and weaknesses, I'm still happy to be me. Here's hoping you find yourself in the midst of some thanks giving and receiving this weekend too. And maybe while we're on the topic, ask yourself, what are you really most thankful for? My favorite weekend to claim my Canadian heritage... Anything to get another Thanksgiving.